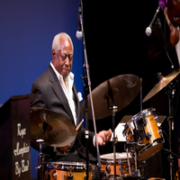 Suite Life is an annual celebration of the life and legacy of pianist, composer and KST namesake Billy Strayhorn. For one night only, percussionist extraordinaire and Pittsburgh jazz icon, Roger Humphries and the RH Factor take the audience on a musical exploration that invokes Pittsburgh’s rich contribution to the history of jazz. The concert is preceded by a VIP reception, and proceeds benefit the Strayhorn Legacy Fund, which supports youth and family programming at the Kelly-Strayhorn Theatre.